A drawing of West Ford around 60 years old by journalist/artist Benson Lossing at the Mount Vernon Plantation in 1859 from the Harper's New Monthly Magazine. 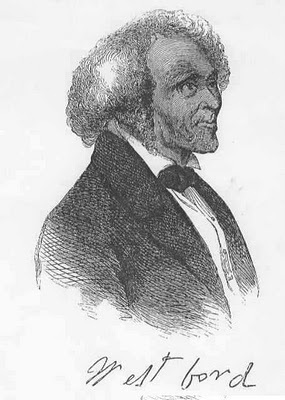 In Lossing's own words he said, "I found him (West) prepared having on a black satin vest and silk cravat, and his curly gray hair arranged in the best manner." West stated to Lossing, "Artists make colored folks look bad enough anyhow." He wrote his name on the sketch when finished. West Ford's motto to his children and grandchildren was to "Stand Tall, Stand Proud." In the book, "I Cannot Tell a Lie: The True Story of George Washington's African American Descendents," it details the birth of Ford and traces his heritage throughout the past 200 + years.